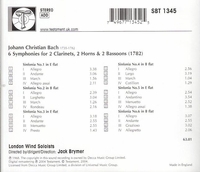 "The London Wind Soloists were fantastic musicians, and this recording is indeed a testament to that. The six symphonies for wind instruments are very classical in character. They are elegant and stately. J.C. Bach used the typical four-movement form and a consistent Allegro for the first movement. The other three movements vary quite a bit and prevent these symphonies from becoming monotonous... This [recording] is of great quality." "…beautifully recorded under the aegis of the late Erik Smith…now immaculately transferred by Testament. About the elegant and spirited playing there can be no doubt. The individual artists are of the highest calibre, they blend their timbres admirably and their phrasing is nuanced, yet never self-conscious."